Headlining the evening’s performance is Dream Crusher, the sprawling improvisational project featuring members of Me and My Arrow, Fort Wilson Riot, Yer Cronies, and others. The band has a large, rotating cast of local music mainstays, and was named one of First Avenue’s “Best New Bands” in 2011. There wlll be a special performance by Tramps Like Us, a Bruce Springsteen cover band featuring members of Gospel Gossip. 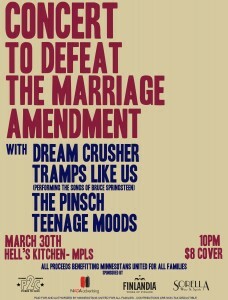 Also playing are Teenage Moods and The Pinsch, a newer female-fronted group with members from Short Fuses, Divebomb Honey, & The Deaf. Doors open 10PM; 18 and over.